Every restaurant has a heartbeat, a soul, and a life. The Milford Oyster House has been full of life, laughter, and happiness since 1985. Eddie and I purchased the business from the founding owners, Jim and Edna Cochran, twenty years ago. Just as they put their heart and soul into it, so did we. We coddled the Oyster House, loved it, and made it our own. During that time we made many good friends. We have helped many of you celebrate landmark occasions, watched your children grow up, and comforted you when things were not so good. The time has come to pass the fun of running the Oyster House on to a new shepherd. Eddie and I are very excited to announce the next chapter of the Oyster House will be written by Tom Kulnis and Rosie Tangtrakul. Tom and Rosie have lived in Milford for the past five years and during that time they have been able to see the Oyster House from their kitchen window. They have fallen in love with Milford and the Oyster House. So much so that Tom came to work for us three years ago. Tom began his kitchen career at the age of 19 and he has worked in many kitchens learning much and honing his own style. 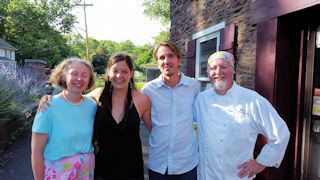 Rosie literally grew up in her parents' popular Lambertville restaurant, Siam. We feel very confident that we are leaving the restaurant in the hands of people who will take care of our community and take care of our staff. Both of these things were very important when choosing a successor. Tom and Rosie plan to open the doors again on Friday, August 19, as The Milford House. Tom's menu is creative with many new tastes for you to try. Tom's style is American comfort food with an international flair. But don't worry, Crab Norfolk and the wonderful oyster on the half shell program will still be in place. Rosie is friendly and caring. I know she will take just as good care of you as I have. I wouldn't leave her in charge if I didn't believe it would be so. Claire and Minni, Melissa, ChrisP and Lauren will still be here to greet you. The Oyster House has withstood the test of time and I know it will carry on with Tom and Rosie at the helm. Site copyright 2016 Mise en Place Inc. All rights reserved.